Made from certified organic red yeast, 100% American made. Regular Delivery — $26.96 with 10% subscription discount. You could receive 300 Cardio Cash for reviewing this product. Directions: Adults take 2 capsules twice daily (morning and evening) with a meal or as directed by a physician. Other ingredients: Organic soy, gelatin, plus one or more of the following excipients: calcium phosphate, magnesium stearate or silica. Other: Do not take more than 4 capsules in a 24-hour period. Do not use if you are pregnant, nursing, have undergone an organ transplant or major surgery within the past 6 weeks. Do not use if you are under age 20. Do not use if have active liver disease or history of liver disease, consume more than 2 alcoholic drinks per day, are taking any medications or planning any medical procedure. Consult your physician before use. Discontinue use and consult your physician if any adverse reactions occur. Immediately discontinue use if you experience any unexplained muscle pain or tenderness, especially if accompanied by flu-like symptoms. Should not be taken in combination with grapefruit products or prescription cholesterol-lowering drugs. First used to treat health concerns in China over a thousand years ago, red yeast rice is the product of a fungus (monascus purpureus) grown on rice. Where is Cardiotabs Red Yeast Rice manufactured? 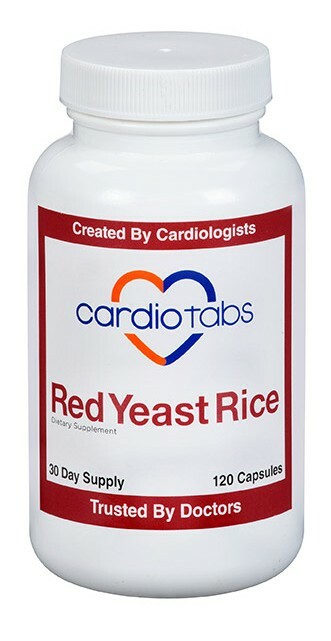 Cardiotabs Red Yeast Rice is 100% grown and produced in the U.S.A.
My doctor suggested I try Red Yeast Rice for cholesterol support and since I was already using Cardio Tabs Omega-3 I never thought twice about trying their Red Yeast Rice product. I've now been taking this supplement for several years and my cholesterol levels are great! I trust the Cardio Tabs brand, as all their products are developed by cardiologists, clinicians, nutritionists and preventive cardiology researchers. They ensure that the ingredients meet the highest of standards and are a safe and effective choice for long-term consumption. I will never look any further than Cardio Tabs, not just for Red Yeast Rice, but for my supplement needs! Thank you Cardio Tabs!! I take 3 of these a week along with watching my diet. I'm 75 and my cholesterol numbers are all within normal parameters. No side effects like leg cramps. 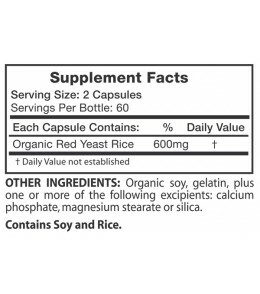 I started using Red Yeast Rice about a 2 years ago because my cholesterol was consistently just above 200 - not bad enough for medications but not good either. After being on Red Yeast Rice for a few months, I was able to promote healthy cholesterol levels and they have consistently stayed in a healthy range. My cholesterol numbers were amazing on a recent lab test I had. My doctor was ready to put me on a prescription but I begged him to let me try Cardiotabs for 60 days. After taking Red Yeast Rice, CardioSterol and CardioTea, my doctor was amazed at the improvement in my numbers and fantastic results. Thank you so much! I took simvastatin for a short time as it made my joints achy. I decided to try red yeast rice, I have had no problem with it hurting my joints, and it helped me support healthy cholesterol levels. It is a great product. 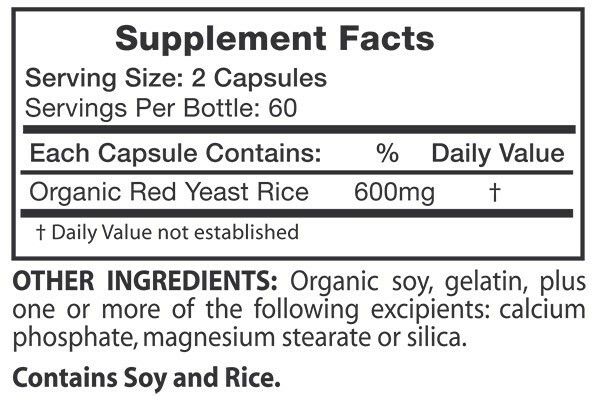 After having trouble tolerating prescription statins, my doctor suggested I try Red Yeast Rice. So I went to the best - CardioTabs - and I'm happy to report that I have had no side effects that I felt from prescription statins and my cholesterol levels have been great. 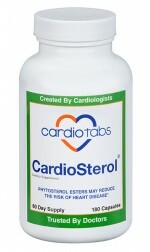 I implicitely trust the Cardio Tabs brand, as all their products are of the highest quality. Thank you for a great product that promotes cholesterol health! My cardiologist recommended this to try before starting me on a statin, and I am grateful I did! After 6 months, I was able to promote healthy cholesterol levels with none of the side effects I would have been concerned about with a Prescription Statin. I just received my lab report after my physical and I have to say the Red Rice Yeast is a big hit. My doctor actually told me my HDL and LDL both are in excellent range. I cannot take the statin’s that doctors prescribe as they affect my joints badly. I would rather take a natural product that is healthier for you. 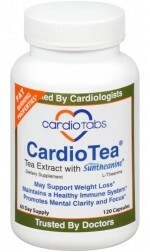 I cannot say enough about Cardio Tabs they have been a big plus in my health reports. Great Product! Just had cholesterol checked....total cholesterol and LDL were at a healthy level! Another positive for this item is that it is a USA grown product! Please log in to your account to write a review.